Stream music wirelessly via Bluetooth to enjoy room-filling sound. Connect up to 3 smart devices at the same time and take turns playing music. Harman noise and echo cancelling technology delivers crystal clear conference calls. 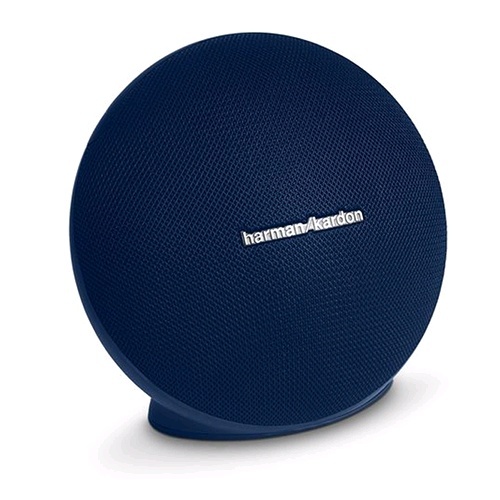 Wirelessly connect two Harman Kardon Wireless Dual Sound enabled speakers to elevate your music listening experience. Crafted from premium materials, the Onyx Mini is a full-featured, portable Bluetooth speaker that delivers signature Harman Kardon sound and design. Its rechargeable battery plays for ten hours while the compact form allows you to take it from room to room. The Wireless Dual Sound feature allows you to connect wirelessly with another Onyx Mini or Wireless Dual Sound compatible speaker which will double the sound output and elevate your music listening experience. Users will be able to make clear phone calls with the speaker from its built-in microphone which is powered by noise and echo cancelling technology.